In disbelief, students walked silently past the entrance to the mailroom and the bookstore where just hours before a student had found a battered and bloody 19-year-old Andrea Racibozynski lying, mortally wounded, on a stairway landing. The student contacted college security who immediately called 911. At 1:35am, The Galesburg Fire Department emergency squad, Police Department and Galesburg Hospitals Ambulance Service paramedics responded to the call that a student had fallen down the steps and was seriously hurt. The first to the scene was the Fire Department from Central Station, only a block away. They immediately instructed other responders to "expedite." Police and paramedics soon followed. Despite no apparent signs of life, personnel at the scene took whatever lifesaving measures they could. Racibozynski was rushed to Cottage Hospital.She never revived and was pronounced dead in the emergency room at 2:11am. Now, the hallway and the landing were wet with bleach-water, scrubbed clean by college personnel.A railing had been removed as evidence. A few reporters waited for a college spokesman to appear. Another student posted a flyer on a door announcing a meeting at 1pm that afternoon. Peter Bailley, the college's Director of Media Relations, set the ground rules after he discussed them with Janet Hunter, a Knox College vice-president. There would be few answers from the college at that time. The Galesburg Police Department had issued a press release acknowledging that a female student had died at Cottage Hospital and the police would be issuing all further statements. Reporters could speak with students if they were willing to talk but could not be badgered. No reporters were to enter any buildings. What was not apparent was the flurry of activity that had been occurring throughout the early morning hours in Galesburg. As emergency room personnel worked unsuccessfully to try to revive the freshman, police started their investigation by knocking on doors on the upper floors of Seymour Hall which also serves as a men's dormitory. To Coroner John Watson, who saw the victim at the hospital, and to emergency personnel who had arrived at the scene, it was apparent that Racibozynski had been viciously beaten-- most likely by a blunt object. Whether Racibozynski was still alive when taken to the hospital is not clear. Watson, who is required to authorize the moving of any body from a crime scene, said emergency personnel acted properly. "I would rather they err on the side of trying to save someone's life. There are cases where the placement of the body is critical to the investigation but that wasn't really an issue here. If there's a breath of a chance, you have to try to save a life-- especially of someone that young." Local police called in the Illinois State Police Crime Scene Technicians who gathered evidence at the scene. As police talked with students, a story unfolded of a fight between the co-ed and a fellow student. The investigation zeroed in on Clyde A. Best, another Knox College first-year student and a resident of Seymour Hall. Galesburg Police Chief John Schlaf says this investigation is a textbook example of how technology such as that utilized by the crime scene technicians and low-tech strategies-- interviewing potential witnesses-- came together to lead to an arrest and the solving of a crime. "I'm very proud of the way our investigative team worked and the cooperation we received from the students." Police investigators awoke Knox County State's Attorney Paul Mangieri at 3:45am Sunday and requested a search warrant for Best's room. Schlaf said that the warrant was necessary for two reasons: to assure that any evidence obtained was acquired legally so that there would be no doubt about its admissability in court and because Best would not sign a search warrant waiver allowing investigators into his room. Mangieri rousted Circuit Court Judge Harry Bulkeley who signed the hastily-prepared search warrant so that investigators could enter and search Best's dorm room. Police officers entered the room soon thereafter, gathered some still-unidentified physical evidence and took Best and his roommate to the Public Safety Building for questioning. The roommate was soon released. Soon thereafter, Bulkeley authorized a second search warrant and officers confiscated a pair of men's bloody blue jeans, rolled up under a seat, and a blood-stained brick from a 1994 Dodge Shadow believed to be Best's. At 10am, the Galesburg Police Department announced that the 18-year-old Best had been charged with the murder of a 19-year-old female student. The name of the victim was still being withheld and was to be released at 2pm after "all immediate family members have been advised." According to Schlaf, Best was informed of his Miranda rights and initially refused both the presence of an attorney and to talk. As he was being processed into the Knox County Jail, Schlaf says Best changed his mind and told the jailer he was willing to discuss things from his perspective with the police. According to Schlaf, Best was again informed of his Miranda rights and acknowledged he understood them. He did not sign a written confession even after Mangieri and a police investigator heard Best tell about the incident in a way that, according to Mangieri, "did not help his case." On campus, stories began to emerge telling of a crime that started as an argument after a fraternity party, escalated into a beating and ended with a fatal blow inflicted by a brick subsequently obtained. In the meantime, Naperville police officers knocked on the door of the Racibozynski home and told Andrea's father the devastating news. He was immediately put in touch with Schlaf who related what he knew. "Mr. Racibozynski is a very religious man," says Schlaf, "and his first request was that prayers be said for his daughter." Schlaf arranged for a priest to administer last rites. Best was encouraged to call his family but he could not reach his mother in Las Vegas, his father or his brother, an attorney in Atlanta. He did leave a message on his brother's answering machine. At 1pm stunned students and faculty members overflowed the 600-seat Harbach Theatre to listen to college President Rick Nahm, Dean of Students John Mohr and Police Chief Schlaf explain what had happened. The meeting was all Schlaf's. For nearly two hours, calm and composed, he shared their grief. Schlaf explained the mechanics of the legal process and what facts of the case he was willing to relate to an audience with split allegiances. As Schlaf acknowledged: "I know I am speaking here to both friends of the victim and friends of the suspect." It was obvious from the questions that there was legitimate and sincere concern for both. Schlaf poignantly responded to a question about motive that cases like this, where no motive is clear, are the hardest to understand but, he added, a motive is not essential, or even an element necessary to the criminal case. He tried to assure other students that Best was cognizant of his rights when he talked and that he waived his right to an attorney during questioning. "I've been told that Mr. Best is a constitutional law student; he understands his rights." Schlaf tried not-too-successfully to justify the visiting policy at the County Jail to students who didn't understand why they couldn't visit Best at will. The Chief deflected questions expressing concern about the effectiveness of the college's own security force as some students wondered out loud how a person could lie near death without being discovered for so long. Nahm said there would be an administrative review of security including at least one open forum on the issue. Schlaf would only say about their relationship that the victim and the suspect were "acquaintances." He indicated that alcohol may have been present but that it "was not a factor in this crime." 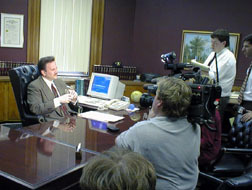 When one student asked if the police would publicly apologize for destroying Best's reputation if he were found not guilty, Schlaf responded, "no." "If we were not at least 99 percent convinced that the suspect committed this crime and we had enough evidence to convict him of it, we would not have arrested him. In this case, I'm 100 percent convinced. That's not to say the judicial system will agree but we have nothing to apologize for." Others asked what bond would be and if they could raise the money to bail Best out. Schlaf responded, "I learned long ago not to second guess what the judiciary will do." In response to questions about how concerned friends could follow the progress of the case, Schlaf admonished the students to attend the proceedings at the court house. "They are all open to the public." Schlaf made clear to the gathering that he considers Knox College to be part of the Galesburg community and that any persons with questions are welcome to call him and his department. "We will meet with one student or with 100 until everyone is satisfied that their concerns are met." After the larger crowd had adjourned, Schlaf sat on the stage and answered yet more questions from a small group of concerned students. Allison Bartelt, WGIL News Director, was performing her routine early-morning rounds when she noticed the flurry of activity at the Public Safety Building and the surprising presence of the Police Chief on a Sunday. She was the first member of the media to learn that a Knox College student had died as a result of injuries to her head. Bartelt called and faxed her story into the Associated Press and it became the lead item on Chicago radio and television morning news. By Sunday afternoon, the name and hometown of the victim had been released and the crime started resonating throughout the midwest. Reporters from Chicago, Naperville, Peoria and the Quad Cities began converging on Galesburg. Monday, Best's first court appearance was at 1:30pm in the Knox County Courthouse. 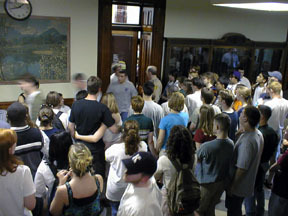 Hundreds of Knox College Students had followed Schlaf's advice to attend the proceedings and packed the traffic courtroom on the first floor and the central hallway. Many more stood outside the front and back doorways. Local and out-of-town media mingled with them. Judge Harry Bulkeley was filling in for Judge Greg McClintock who was in Virginia for computer training. Bulkeley, who had issued the two search warrants, was familiar with the evidence in the case. Charles Best, brother of the accused, had arrived from Atlanta and asked for permission to represent his brother during bail-setting. Though he is an attorney, he is not licensed in Illinois. Mangieri and Bulkeley consented. Best said that he had contacted two local attorneys but both had conflicts. Jeremy Karlin of Barash & Stoerzbach confirmed that he talked to Charles Best but that his firm represents Knox College and he could not handle the case. "I would have loved to have handled it if the case remained here but I just couldn't." Bill Butts said that he, too, had talked with someone about handling the preliminary matters in the case but he had a trial scheduled at the same time. Bulkeley announced that Best had been charged with three counts of first degree murder. Mangieri asked for bond to be set at $1 million because of the seriousness of the crime. Charles Best said $100,000 would be more appropriate for this, a first-time offense. Bulkeley ruled that bond be set at $150,000 and admonished Clyde Best that if he would be released on bond and left town, he could be tried and convicted in his absence. Bulkeley then suggested that the Public Defender be appointed in the meantime so that the preliminary hearing could be set. Charles Best would have none of it: "We will soon have private counsel." Bulkeley set the next hearing for 2pm on April 6th assuming an attorney had been hired. In an impromptu press conference after the bail hearing, Mangieri expressed dissatisfaction with the low level of the bond, "I've been doing this long enough to know that I should not be pleased or disappointed at the actions of an independent judiciary." He also was reluctant to discuss any additional details of the evidence collected or the crime itself: "As the facts of this case come out in further proceedings, I think things will become clear to everyone." A day later, Bulkeley raised the bond to $300,000. Mangieri explained why three counts were charged: "The first count is first degree murder with intent to kill; the second count removes the intent but says the action created a strong probability of death or great bodily harm; the third count says that Best committed a forcible felony, aggravated battery, which resulted in death." Mangieri says he has no intention of filing any lesser charges-- such as manslaughter or aggravated battery. "This is a murder case." Potential sentencing upon conviction is 20 to 60 years for first degree murder. Mangieri added that this is not a potential capital case but that life imprisonment is a possibility if he can prove that special circumstances were present. "That could be excessive brutality or if the crime was heinous in nature." The body was sent to a forensic pathologist in Bloomington who concurred with initial reports that death was due to massive head trauma. Toxicology reports will take several weeks. Rick Nahm sent 3,000 letters to every Knox College student, faculty member, employee and parent of a student. In it, he shared his grief, the news up until then, and his confidence that there was "no indication that any other persons were involved." He reiterated that professional support services were available to any student who desired them. The college provided transportation by van to Naperville on Tuesday for anyone wanting to attend Racibozynski's visitation and again on Wednesday for the funeral mass. Mangieri and Schlaf are convinced they have the right man: "There is nothing to indicate anyone else at Knox College is at risk," adds the Police Chief. It's clear that many members of the Knox Community are still in disbelief that the first murder in the 162-year history of Knox College has disrupted their idyllic lives. Clyde A. Best, the accused killer of Andrea Racibozynski, remains a model prisoner in the Knox County Jail while thousands of students, faculty and staff at Knox College wonder how this murder could have happened. They ask if there were signs that might indicate a propensity to violence in Best or if there was something that the Admissions Department may have seen before approving his application. They also question security procedures on the campus. While campus officials must protect students from outsiders, such as the performer who allegedly assaulted a female student last year, they now must take on the task of protecting students from themselves-- all without implementing procedures that could lead to a police-state mentality. Recent campus discussions have indicated that the battered body may have gone undiscovered for a much shorter time than the half-hour originally estimated. Campus-wide debate of security issues will be on the agenda for some time. At Monday's hearing before Judge Greg McClintock, which resulted only in a continuance, no new information was forthcoming. Peoria attorney Donald Jackson entered an appearance to represent Best and later refused to talk with the media; he even snapped to one Peoria television reporter: "What part of 'no comment' don't you understand?" State's Attorney Paul Mangieri held a conference with Jackson after the hearing to, according to Mangieri, "establish some ground rules and explain our procedures." McClintock says Jackson is no stranger; "We both attended law school at the University of Illinois. He was a year ahead of me. I remember him but I don't think he remembers me." Best's background and history remains clouded as neither Knox College officials or the police department will release any information that could be part of their investigation. It is nearly impossible to get anyone to speak on the record. Two troubling bits of information have emerged, however. Police Chief John Schlaf acknowledges that they are investigating reports of an incident on campus that may prove to be prophetic. Best allegedly was involved in a dispute during a pick-up basketball game in which his temper erupted and he had to be restrained by a fellow student. The other issue relates to Best's part-time job. While a first-year student at Knox, he reportedly held a job at Galesburg Adult Book and Video on N. Henderson St. Terry, the manager at the store, says he hired Best and that he worked there until about March 15th. "Clyde was an excellent worker. He was bright, intelligent, courteous. I even promoted him to assistant manager. He was the most intelligent assistant manager we've ever had. Everybody liked him-- especially customers. A lot of them are in shock over this. We were just numb when we heard the news." Terry says that Best was not particularly interested in the adult materials in the shop. "He never questioned anything that went on in the arcade. I hired him because he wanted to work­­ not because he had any interest in the merchandise we sell. I try not to hire people who are into this stuff. He was surprised when I hired him. He said that he had heard on campus that 'no black man had ever worked here.' That's just not true. Clyde was the kind of employee we like. He said he had to make a car payment and that means he needed the money." "Clyde was very straight. He told us he didn't do drugs. He was constantly trying to please other people­­ especially his brother. He idolized him; he was always trying to impress him. He wanted to be a lawyer like his brother," said Terry. On March 15th, Clyde Best just walked out of his job there. "He had said he was going to leave at Spring break to visit his sister in New York. He quit sooner because he said the hours were interfering with his schoolwork. He was terrified his grades were going to drop. Clyde had earlier left me a note, 'Terry, you need to hire somebody else; it's hurting my grades." Terry says that the last week Best worked, he seemed a little different: "He was disconnected, distant, he was somewhere else." The first week he worked there, he was in training. Terry says a girl brought him his lunch on several occasions-- a girl Terry believes was Andrea Racibozynski. As the legal proceedings continue, more information will undoubtedly emerge about Best's background and the gruesome crime his is accused of committing. His last paycheck is still waiting for him. State's Attorney Paul Mangieri and attorneys for accused murderer Clyde Best both agree that the suspect needs to see a psychiatrist. In motions scheduled to be filed late Wednesday, Judge Greg McClintock will be asked to order that Best see a court-appointed psychiatrist to ascertain if he is fit to stand trial. Mangieri says that he has had reports from the jail of behavior which "cannot be disclosed" indicating that Best may have some serious emotional problems. "We need to know if he understands what's happening and that he is able to stand trial." According to Mangieri, if Best is judged unable to stand trial, he will be sent to a state psychiatric institution for 90 day periods after which he would be evaluated after each 90 days until ruled sane enough to be tried. Since being incarcerated in the Knox County Jail, Best has been taking psychotropic medications to treat anxiety and depression. Mangieri is also concerned that those drugs may also be affecting Best's ability to understand the proceedings. At the Coroner's inquest Tuesday evening, the death of 19-year-old Knox College student Andrea Estelle Racibozynski was ruled "homicide" by the 6-person jury. Galesburg Police Department Detective Sgt. David Clague said that her injuries could not have been caused by falling down the steps. "There was blood on the second floor, first and main floor landings, the stairs, the railing and outside the entrance door" to Seymour Hall. "Near where the victim was found, we located three pieces of a broken brick, all with blood stains." The autopsy report confirmed that Racibozynski died from "severe blunt force trauma injuries to her head." Clague said these were consistent with being beaten with a brick. In addition, the autopsy indicated several facial injuries and internal injuries, some of which may have been severe enough to cause death but which were not the predominant cause of death."